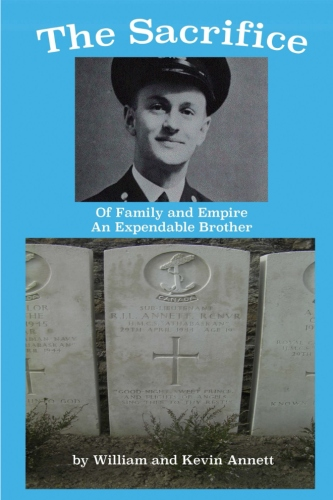 Now available from Amazon and Createspace: A Stirring Work of Remembrance and Exposure by Bill and Kevin Annett "The Sacrifice: Of Family and Empire – An Expendable Brother"
"The Sacrifice: Of Family and Empire – An Expendable Brother"
The Sacrifice describes the sinking of the destroyer HMCS Athabaskan in April, 1944, and of how Sub. Lt. Robert Annett and ninety other Canadian sailors were left to drown in the English Channel by the British Admiralty. Drawing on navy and archival sources, the Annetts explore recent evidence that suggest it was "friendly fire" by a British Torpedo boat, and not the Germans, that dealt the death blow to the already-crippled Athabaskan. The Sacrifice delves into the British colonial history of crime and cover up, and of how those who fight for the Empire can end up being immolated by it. Combined with personal accounts of the impact of war on one family and of Robert Annett's self-sacrificial death for a wounded sailor, this work is a moving tribute as well as a wake up call.